Wallpapers are a great way to add interest and colour to any room. However, choosing the right wallpaper for your space is equally as important as instaling it perfectly. Here is a list of 5 tips to consider before investing in a particular pattern to ensure you choose the right one for your space, style and project. When looking for the perfect wallpaper design, look at a large variety of designs and consider all of the options. Follow us on Pinterest and create a folder or board of images that you love and then imagine them in your own space. Don’t get too caught up on one particular pattern too soon and remember to keep a relatively open mind when it comes to choosing the right wallpaper for your space. As you would with a paint sample, you should always grab a sample of the wallpapers you are considering too. Temporarily attach it to the wall where you want it to be applied and quietly observe it over the next few days. This will help you notice how it looks at different times of the day as well as how it matches the furniture and other items in the space. 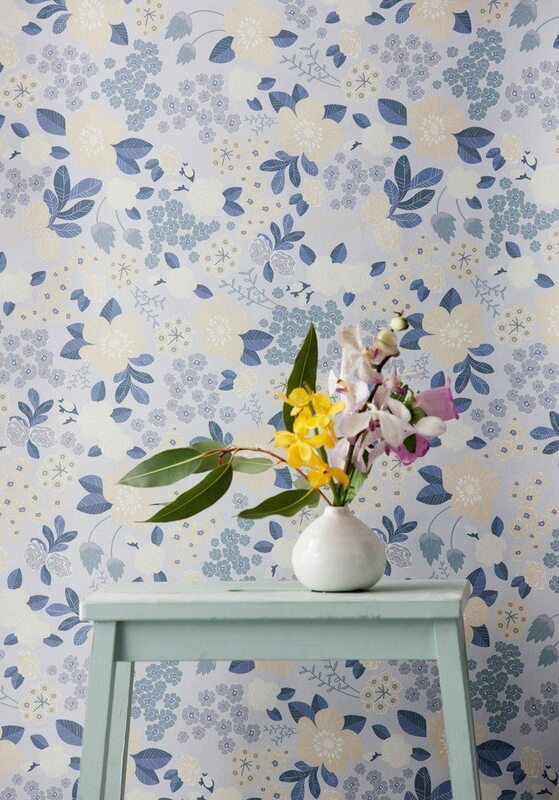 You can order samples of any of our wallpapers, just add them to cart and select the sample size online. If you have a room or home theme, try to stick with that when choosing your wallpaper design. This will ensure the space matches and flows with the rest of your home and doesn’t appear out of place or strange. This will also help in guaranteeing that the design matches perfectly with the décor items and your own personal style too. If you have a smaller sized room, consider using a lighter shade of wallpaper like Flower Garden (Blues) to trick the mind into thinking the room is larger and the ceilings higher. Darker coloured wallpapers will tend to bring the walls in and make the room visually appear smaller in size. Additionally, colours also can make a big difference in your personal feelings. Cooler colours put across tranquillity whereas warm colours appear to make a space feel warmer. So, the purpose and mood of the room will have a big impact when you are choosing a wallpaper for your space. The scale of the pattern of the wallpaper can completely change the room dynamics. A larger scale print tends to make a room feel more intimate whilst a smaller pattern gives the illusion of more space and light. Observe your room and understand what you want to achieve with the wallpaper. Choosing the right wallpaper can be a hard task if you don’t know exactly know what you are looking for or what you want to accomplish in your room. If you need some assistance in knowing what to consider when purchasing a wallpaper, we hope these five tips give you some guidance in making a confident decision to select the perfect wallpaper.